This book focuses on the work of Po Shun Leong, architect, artist and self taught woodworker. The book opens with a brief biography of Po Shun, and quickly moves to a short history of art boxes and insights from the subject on his approach to designing and building art boxes. The next section of the book is an extensive photo gallery of Po Shun's work. I have to say the work is striking in its visual impact, creativity, and complexity. I should include a description of art boxes as designed and built by Po Shun. These are not the kind of boxes that most of us would think of when we hear the word 'box'. These are works of art, built using numerous species of wood chosen for their color and texture, cut in simple geometric shapes and combined to build a form of sculpture. I would liken them to three dimensional intarsia, or reverse sculpting, instead of starting with a large block and removing material, Po Shun builds a sculpture by adding material. 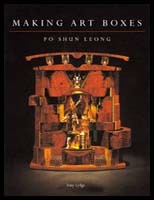 The book then moves to a short section on how to build art boxes similar to the works of Po Shun. This section hits on finding inspiration, sketching and building small scale models before starting on the piece itself. It includes a description of the artist's studio, the tools he uses and the way he finishes his work. The last section contains plans for building five different art boxes. The plans are well done and are easily followed. They include a cut list, an exploded drawing and step by step instructions. The plans would be a great place to start building these types of boxes. The joinery is simple and straight forward, and it is easy to create striking pieces following these plans. Overall, I liked this book, even though it covers work that I don't typically do. I found it interesting and well done, and it is always a good idea to expand one's horizons. Even if you never plan on building pieces like those in this book, you may be able to incorporate some of the included ideas into what you do build.